The undertunic. The pattern I began with for this costume was Simplicity 4942. I has been altered at the collar and front seams. The collar height has been reduced by about half and the front curve altered to a more dramatic 'v' shape. The front seam on one side has been extended so that there is a 1 inch overlap beneath the front hook and eye closures. The neckline for the collar setting was also altered, to give a round neck opening instead of the V-neck with insert used by the pattern company. The length was cut to the "Theoden" version shown as version A on the envelope. 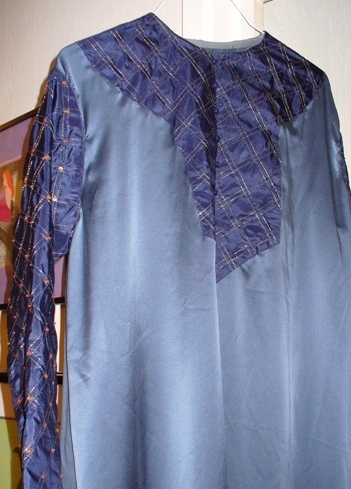 The blue undertunic is silk charmeuse with buttons on the front closing. The charmeuse was cut with the 'shiny' side out and the 'sandwashed' side in. The sleeves and neck section are navy silk taffeta. 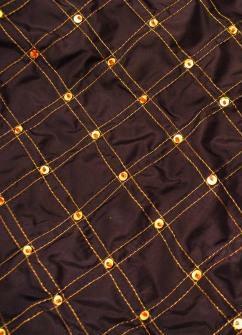 The embroidered "quilting" design was done on the sewing machine with Sulky thread. The sequins cwentered with red seed beads were added by hand afterward. There are no sequins or beads on the neck section which is completely hidden under the velvet surcoat. Tip: When doing machine embroidery with gilt thread, put the thread in the bobbin not on the upper reel of the sewing machine. You may also find that you prefer to wind the bobbin by hand, as I do, to prevent wear to the gilt layer of the thread. You can use a regular light yellow thread of matching weight in the upper reel. I show here also the model I used for this piece. 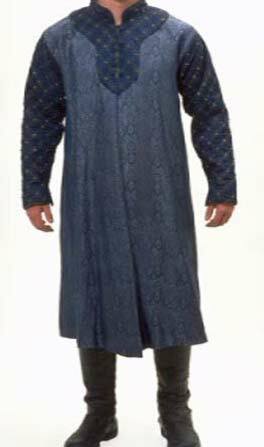 Since Faramir's coronation garments were not seen for very long and not documented on the DVD, I used the undertunic photos from the garments he wears during one of the houses of healing scenes as shown below. The coronation garments on exhibit at FIDM were apparently all in one piece, but this would not have been likely in "real" clothing, so I have made two separate pieces. The main difference between the two under tunics is the lack of a collar on the coronation version.